DPCI implemented the Drupal Web content management system to support a collective of three museum Web sites, as well as a distance learning portal for online educational programs. 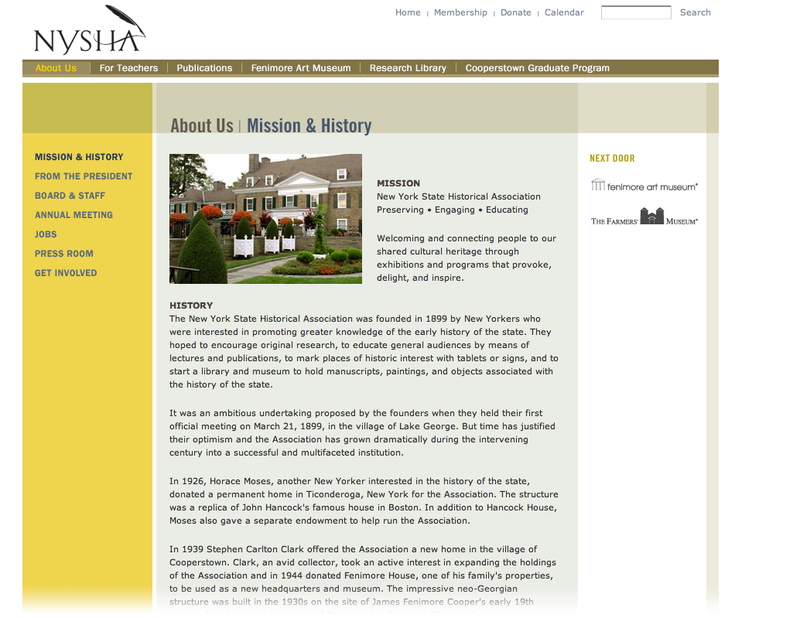 DPCI Delivers Integrated Web Portal to New York State Historical Association. Drupal's multi-site administration capabilities allow NYSHA to share content among the sites and sections in the appropriate theme. The system will auto-select the appropriate theme based on taxonomy, URL, or domain. 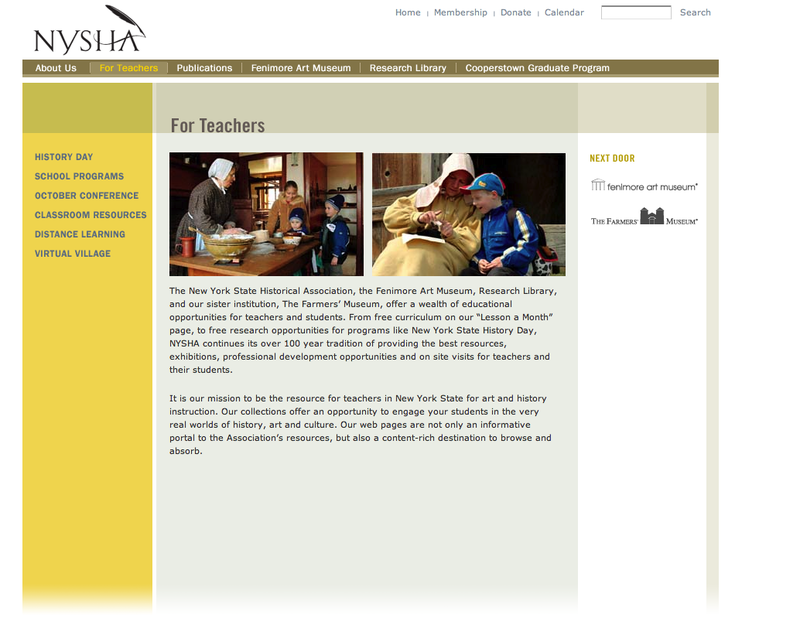 Founded in 1899, the New York State Historical Association (NYSHA) is a private, non-profit, membership-based, educational and cultural institution dedicated to preserving, collecting, and interpreting art and historical artifacts significant to New York State's rich history and American culture. NYSHA's remarkable collections, showcased in the Fenimore Art Museum, comprise some of the best examples of American landscape, history, and genre paintings; the renowned Eugene and Clare Thaw Collection of American Indian Art; and one of the nation's most comprehensive and significant folk art collections. 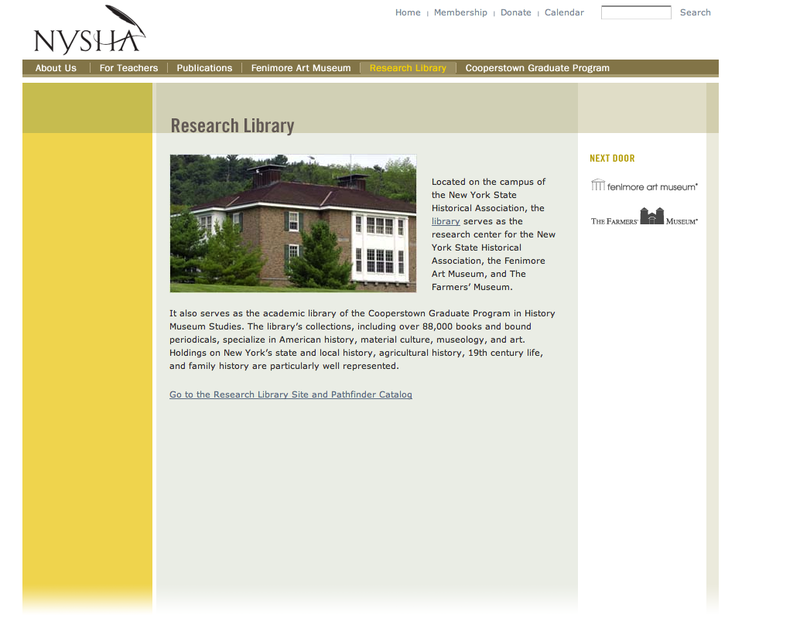 NYSHA also operates a Research Library, whose holdings include over 90,000 volumes on American, New York State, and local history as well as educational programming and training for K-12 students and teachers across New York State. Across the street is The Farmers' Museum which was founded in 1943. The Farmers' Museum is one of the nation's leading outdoor living history museums. It recreates the rhythm of life in 19th century central New York State and houses an important collection of decorative arts, implements, conveyances, documents and architecture. In order to satisfy budgetary constraints for each museum, NYSHA, Fenimore, and Farmers' shared one Webmaster. This individual was responsible for managing and updating all of the Web site content, which mostly contained static HTML content. Although this process saved money, updating the sites was cumbersome, time-consuming and required technical knowledge of HTML. Working with DPCI in conjunction with a small design agency, NYSHA envisioned a new system with the capability to centrally manage all three sites and enable non-technical users to assist in adding and updating content. The need to implement a Web content management system was paramount. "Balancing our need to expand the content and services delivered across each Web site, the integration of a CMS offers a cost-effective approach that will not only help communicate and promote various exhibitions and programming in a timely manner, but also empower our non-technical employees to participate in the process," explained Wayne Mellor, Vice President for Marketing and Finance at NYSHA. Additionally, NYSHA wanted to add feature-rich, dynamic content to promote items and collections in its archives and museums. NYSHA also needed to integrate distance learning applications to support educational outreach, as well as e-commerce functionality that tied into its existing point of sale system. Adding other features such as email management also enabled NYSHA to keep subscribers informed about upcoming events and exhibits. "We enjoyed helping NYSHA identify a series of features and functionality that allows each site to deliver a more ‘sticky' Web experience," said Tracy Gardner, Vice President of Client Services at DPCI. "NYSHA's designer delivered the visual specifications and left it to us to deliver a quality technical implementation, including integrating the Drupal Web content management system, distance learning and e-commerce applications." Based on NYSHA's requirements, DPCI implemented a Web content management system that supports all three Web sites, as well as a distance learning portal for online educational programs. DPCI customized the Drupal Web content management system to meet NYSHA's needs, enabling all types of users, regardless of technical experience, to update content such as text, photos, and bulletins. As part of the Web content management system implementation, DPCI configured a Web portal to facilitate NYSHA's distance learning curriculum. This gives teachers the capability to work with museum educators to learn about various collections and experience "virtual tours" of the museums via the Internet. Addressing the need to leverage the merchandise offered at the museums, DPCI integrated e-commerce functionality into the Web sites. This included back-end integration into an existing point of sale (POS) system. Visitors can browse through the online catalog and purchase antiques, books, folk art, and jewelry, as well as other gifts and collectibles. The new Web portal provides NYSHA, Fenimore, and Farmers' with the capability to extend their presence outside their physical locations. 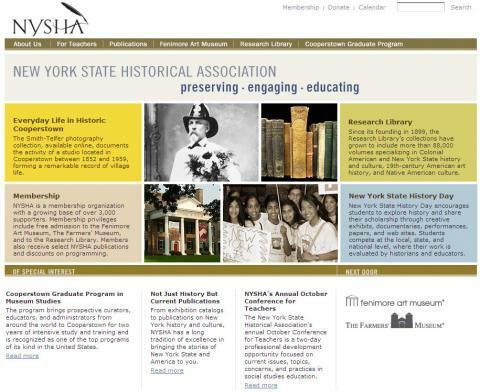 From an administrator's perspective, NYSHA and its museum partners can easily update and maintain their Web sites at a fraction of the time it took in the past. This has allowed them to utilize the Internet to promote new collections and galleries. NYSHA has also improved its ability to increase its membership and donations. "The Web redesign and portal implementation is part of a broader plan to expand our presence within and beyond the walls of the museums to promote New York State's cultural heritage," explained Mellor. "Through the CMS and the efforts of DPCI, we now have a powerful online toolset to complement the physical collections in our museums."